North Carolina teachers marched for better pay last May. 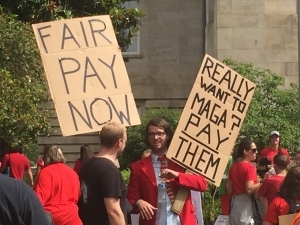 Remember the big teacher march and rally last May that brought more than 19,000 educators to downtown Raleigh to demand better pay and increased funding for public schools? Round 2 is planned for May 1. “We think it’s going to be bigger than last year,” said Mark Jewell, president of the N.C. Association of Educators. Jewell asked teachers to take a personal day May 1 to come to Raleigh for a day of action around K-12 issues. He made the request during the NCAE’s annual convention, which took place in Raleigh March 22-23. 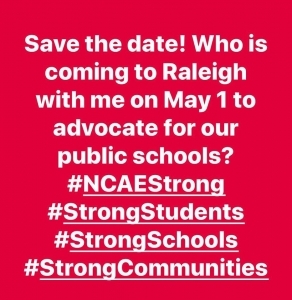 Julio Morales, the North Carolina director for the National Education Association, also posted news about the event on his Facebook page. The NCAE is the state’s largest education advocacy organization for public school employees, and represents active, retired, and student members. This story was updated March 25.